Kylie Jenner’s vacation wardrobe is amazing spring break inspiration. If any of you follow Kylie Jenner on Instagram, then you know that she went on vacation in January for the News Year. She never disclosed where she and her “posse” went, but I truly wish she did because it looked AMAZING! Truly so tropical and beautiful. She went with Travis Scott, their daughter Stormi, and Jordyn Woods. One thing I loved about the pictures she shared with the public were the outfits she wore. They were bright, colorful, and truly perfect for spring. Because of this, I am going to put outfits together that are similar to Kylie Jenner’s vacation outfits so that we all can look just as fabulous as she did! These would be amazing spring break inspiration if you haven’t gone yet. First off, this picture of Kylie is BEAUTIFUL! The sun, the hat, the orange dress: I love it all. Makes me wish I was on a beach right now. Orange is in. This color is showing up everywhere and I’m loving all the styles. Which is why I picked four different dresses for this outfit. I felt like all of these were similar to Kylie’s vacation outfit. Now, you can pick the one that calls out your name the most! Beginning of Spring = BIKINI SEASON! This is the time of year when all the stores drop their new bikini collections. This year we will be seeing a lot of neons, sequins and bandeau tops. Will I be adding new bikinis to my already packed bikini drawer? Absolutely. I love that Kylie, Jordyn and Stormi are all matching with the neon green bathing suits. And they are all in different styles! Kylie continued the neon green theme with a neon green two piece set. She wore it to attend a gorgeous dinner on the beach. SO DREAMY! She looks beautiful and here’s a set that will make you look just as beautiful. This outfit of Kylie’s is casual, comfy and cute. Three things you totally want to be when you are on vacation. I love that she added the cheetah scarf on her head. Adds some serious sass to the outfit. The sports bra Kylie is wearing is actually from Jordyn’s online street style activewear store called Secndnture. Sadly, that exact sports bra is currently sold out. Lastly, Kylie shared another gorgeous post where she’s on the beach with the sun setting behind her. Naturally, she’s wearing a stunning dress. This dress is silver, metallic and light-weight, which is perfect for a tropical vacation. 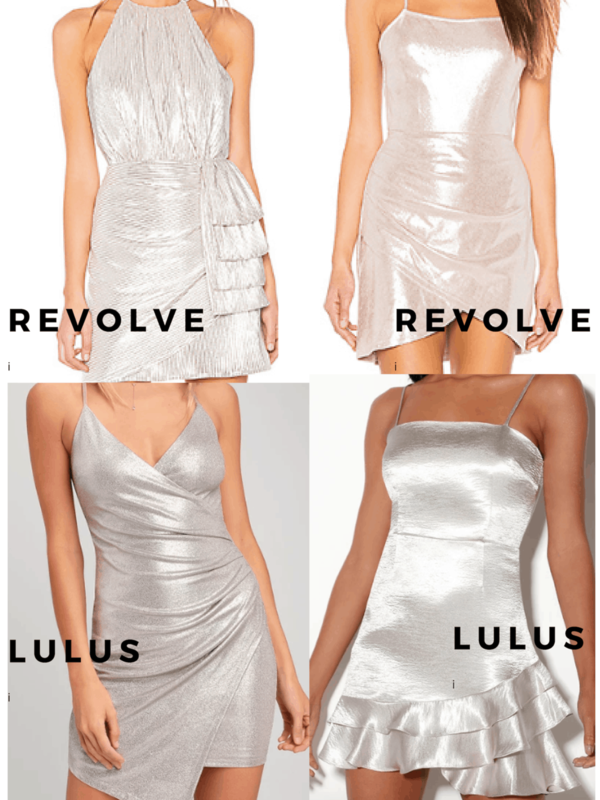 I found 4 different styles of silver dresses that I thought were great dupes for Kylie’s dress. I would personally wear all of these on different occasions. These dresses are perfect for a fancy dinner, a formal dance or party. Which Kylie Jenner vacation outfit is your favorite? Out of these four, which would you wear? Let me know in the comments below!